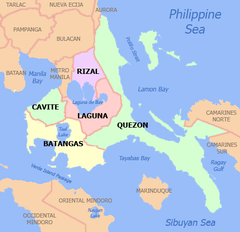 Laguna, officially known as the Province of Laguna (Filipino: Lalawigan ng Laguna ; Spanish: Provincia de La Laguna), is a province in the Philippines located in the Calabarzon region in Luzon. 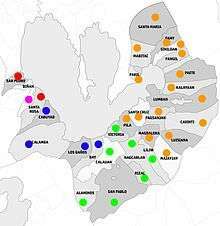 Its capital is Santa Cruz and the province is situated southeast of Metro Manila, south of the province of Rizal, west of Quezon, north of Batangas and east of Cavite. Laguna hugs the southern shores of Laguna de Bay, the largest lake in the country. As of the 2015 census, the province's total population is 3,035,081. 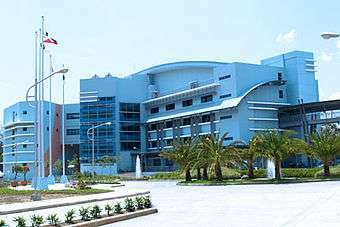 Province of Laguna is the second ISO 9001:2008 certified province in the Philippines. 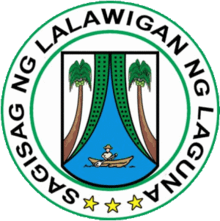 The Province of Laguna, which was formerly called La Laguna and La Provincia de la Laguna de Bay, was named after Laguna de Bay, the body of water that forms its northern boundary. 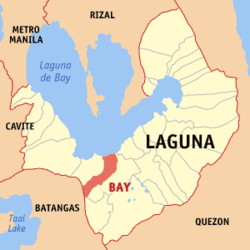 Laguna de Bay, in turn, was named after the town of Bay (Laguna de Bay is Spanish which means "Lake of Bay"), the first provincial capital. Captain Juan de Salcedo with a band of one hundred Spanish-Mexican soldiers conquered the province and its surrounding regions for Spain in 1571. Seven years later, two Franciscan friars started the work of Christianization. In 1577, the Franciscan missionaries arrived in Manila, and in 1578 they started evangelizing Laguna, Morong (now Rizal), Tayabas (now Quezon) and the Bicol Peninsula. Juan de Plasencia and Diego de Oropesa were the earliest Franciscans sent to these places. From 1580, the towns of Bay, Caliraya, Majayjay, Nagcarlan, Liliw, Pila, Santa Cruz, Lumban, Pangil and Siniloan were founded. In 1678, Fray Hernando Cabrera founded San Pablo de los Montes (now San Pablo City) and built a wooden church and convent considered as the best and finest in the province. In 1670, delimitation of borders were made between Lucban, Majayjay and Cavite. The populous town at that time was Bay, the capital of the province until 1688, when the seat of the provincial government was moved to Pagsanján, and later in 1858, to Santa Cruz. In 1754, the Province of Laguna and Tayabas were divided, with the Malinao River separating the towns of Majayjay and Lucban. The province became a bloody battle ground for the Chinese during the two instances that they rose in revolt against Spain. In 1603, the Chinese made their last stand in the mountains of San Pablo, and in 1639, they fortified themselves in the highlands of Cavinti and Lumban, surrendering in Pagsanjan a year later. The natives of Laguna proved loyal to the Spanish crown during the British invasion (1762–1764) when thousands rallied to its defense. When a detachment of British troops under Captain Thomas Backhouse entered the province in search of the silver cargo of the galleon Filipino, Francisco de San Juan of Pagsanján led a band of volunteers that fought them in several engagements in and around the town which was then the provincial capital (1688–1858). Backhouse plundered the town and burned its newly reconstructed church but San Juan succeeded in escaping with the precious hoard to Pampanga where the treasure greatly bolstered the defense effort of Simón de Anda, leader of the resistance movement. For his heroism, San Juan was made a brigade commander and alcalde mayor of Tayabas (now Quezon) province. The people's loyalty gradually degenerated into bitter hostility. Grave abuses by the colonizers, especially those of the clergy, caused the resentment of the natives to be fanned into a rising flood of insurrection. In 1840 for instance, religious intolerance led the people of Majayjay, Nagcarlan, Bay, and Biñan to join the revolt of Hermano Pule (Apolinario de la Cruz) of Lucban, Tayabas. Laguna was also exposed to the aspirations of its most famous son, Dr. José Rizal, who was born in Calamba. The persecution of the Rizal family, along with their fellow landowners toward the end of the century further aggravated the situation. In 1896, thousands of inhabitants, especially of Bay, Los Baños, Nagcarlan, Magdalena, Santa Cruz, and Pagsanjan had joined the revolutionary Katipunan. Laguna was one of the eight provinces to rise in revolt against the Spanish misrule led by Generals Paciano Rizal of Calamba, Severino Taino of Pagsanjan, Agueda Kahabagan of Calauan, and Miguel Malvar of Batangas. The ill-equipped revolutionaries fought the well-armed enemy until on August 31, 1898, when the last Spanish garrison surrendered to the victorious patriots in Santa Cruz. The province was cleared of Spaniards. There had been only one respite, the Pact of Biak-na-Bato on December 14 to 15, 1897. Upon the outbreak of the Filipino-American War (1899–1901), Generals Juan Cailles and Paciano Rizal led the defense of Laguna until June 30, 1901, when surrender became inevitable. Cailles became the first Filipino Governor of Laguna under the American flag. Laguna was also the birthplace of a famous revolutionary hero Teodoro Asedillo during the American colonization period. He was considered as bandit during those times by the Americans but hailed as hero by the local town folks of Laguna. He fought for labor and civil rights of the Filipino people. The establishment of the military general headquarters and military camp bases of the Philippine Commonwealth Army and the Philippine Constabulary is a military unit organization was founded on January 3, 1942 to June 30, 1946 in the province of Laguna, and aided of the local military regular units of the Philippine Commonwealth Army 4th and 42nd Infantry Division and the Philippine Constabulary 4th Infantry Regiment. Started the engagements of the Anti-Japanese Military Operations in Southern Luzon, Mindoro and Palawan from 1942 to 1945 against the Japanese Imperial forces. Beginning in 1945, attacks by the Filipino soldiers of the 4th, 41st, 42nd, 43rd, 45th, 46th and 47th Infantry Division of the Philippine Commonwealth Army, 4th Infantry Regiment of the Philippine Constabulary and the recognized guerrillas against Japanese forces in Laguna increased in anticipation of the Liberation of the Philippines by joint Filipino & American forces. 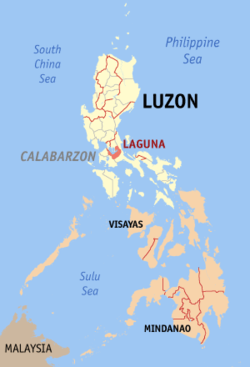 Laguna covers a total area of 1,917.85 square kilometres (740.49 sq mi) occupying the north‑central section of the CALABARZON region in Luzon. The province is situated southeast of Metro Manila, south of Rizal, west of Quezon, north of Batangas and east of Cavite. Laguna lies on the southern shores of Laguna de Bay, the largest lake in the country. On the southern border of the province are Mount Makiling and Mount Banahaw, both are long dormant volcanoes, but still sources of geothermal energy. Mount Makiling is popular for the numerous hot spring resorts that are found on its slopes. 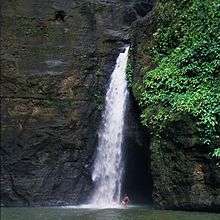 Pagsanjan Falls, is a popular waterfall that tumbles down a deep gorge in the hills. The eastern portion of Laguna straddles the southernmost portions of the Sierra Madre mountain range. The province is relatively dry from November to April and wet during the rest of the year for a small portion near the southern boundary. The other parts, west of Santa Cruz municipality, experience a dry season from November to April and rainy season during the rest of the year. The eastern and southern most portions do not have distinct season, with rainfall more evenly distributed throughout the year. 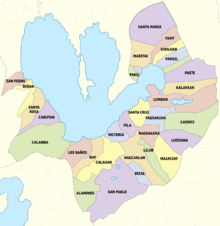 Laguna comprises 24 municipalities and 6 cities. As of 2015, Laguna is composed of 5 districts. The population of Laguna in the 2015 census was 3,035,081 people, with a density of 1,600 inhabitants per square kilometre or 4,100 inhabitants per square mile. Most of Laguna people are Roman Catholic followed by a large majority of the population at 70% (San Pablo (Diocese) [Catholic-Hierarchy], 2010). Several Christian groups are also present such as Aglipayan Church with 20% of the population and the rest are Members Church of God International, Baptists, Jesus Is Lord Church, Iglesia Ni Cristo, Methodists, Church of Christ of Latter-Day Saints, Jehovah's Witnesses, Presbyterians, Seventh-day Adventist and other Mainline Protestants. Non Christians are usually Muslims. Present-day Laguna shows a thriving economy. With a population of 3,035,081 (2015 census), and a total area of 1,760 km2 (680 sq mi) of land, Laguna produces millions of pesos worth of coconuts, rice, sugar, citrus fruits, lanzones and other products. Tourists flock to its beauty spots, especially Pagsanjan Falls, Calamba and Los Baños hot springs, Mount Makiling, Caliraya Lake and many others. Levels of development vary. The towns near Metro Manila have become industrialized whereas the inner towns continue to engage in agricultural production or pursue agri-based industries and cottage and small-scale industries. There are about forty rivers in Laguna with a total area of almost 0.5 square kilometres (0.19 sq mi). 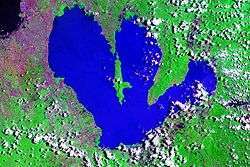 The Laguna de Bay has an approximate area of 3,800 square kilometres (1,500 sq mi) broken down into 2,900 square kilometres (1,100 sq mi) of land and 900 square kilometres (350 sq mi) of lake proper with 220 kilometres (140 mi) shoreline. Laguna has an estimated 300 million US gallons (1,100,000 m³) of underground water. At least seven principal water basins in the province with a total of 5,773 square kilometres (2,229 sq mi) drainage area and 1,316 square kilometres (508 sq mi) level area provide an estimated 9.238 square kilometres (3.567 sq mi) total run-off annually. Laguna has 60,624 hectares (149,810 acres) of alienable and disposable agricultural land. About 41,253 hectares (101,940 acres) or 23.44% of Laguna’s total land area is forest land. Laguna de Bay, with a surface area of 900 kilometres (560 mi), is the province's main fishing ground producing 410,000 mt(?) of fish. Carp and tilapia fingerlings are also being grown in inland ponds and freshwater fish pens. The research institutions located in Los Baños are: International Rice Research Institute (IRRI), ASEAN Center for Biodiversity (ACB) and the Southeast Asian Regional center for Graduate Study and Research in Agriculture (SEARCA), among others. On May 21, 2014, the COMELEC En Banc unseats E.R. Ejercito in a unanimous decision for overspending of campaign funds for his running for the 2013 Laguna gubernatorial elections, Vice Governor Ramil Hernandez will take over the position of Ejercito. And on May 27, 2014, Vice Governor Ramil Hernandez took oath and became the acting governor of the province, making Ejercito the first local official in the Philippines to be formally ousted in office due to overspending. Calamba Rizal Shrine South Luzón Tollway - Calamba Exit via National Road to J.P. Rizal Avenue The Rizal Shrine is located in Calamba and features the home of José Rizal. Biñan Alberto House South Luzón Tollway - Batangas City Exits, via National Road Ancestral House of Teodora Alonzo's (Jose Rizal's mother) clan. Pinagbayanan Crematorium South Luzón Tollway- Calamba Exit via National Road to Pila The Philippines' oldest crematorium. Cavinti Pagsanjan Falls SLEX - Calamba Exit via National Road The Magdapio Falls used to be called the Magdapio Falls but have become popularly known as the Pagsanjan Falls because the trip starts in Pagsanjan. Nagcarlán Eight mountains It includes Mt. Atimla, Mt. Mabilog, Mt. Nagcarlán, Mt. Malauban, Mt. Lansay, Mt. Bayaquitos, Mt. Cristóbal and Mt. Banaháw. San Pablo Seven Lakes of San Pablo It includes like Sampaloc Lake, Lake Bunot, Lake Calibato, Lake Pandin, Lake Yambo, Lake Palakpakin, and Lake Muhikap. Cavinti Cavinti Underground River and Caves Complex A newly discovered tourist attractions that according to native Cavintinians is composed of more than a hundred Caves. Calamba Private and Public Resorts Calamba has 661 resorts making the city as the "Resort Capital of the Philippines". Calamba St. John the Baptist Church One of the oldest churches in Laguna. Jose Rizal has been baptized in this church by Fr. Pedro Casañas. San Pedro San Pedro Apostol Parish Church SLEX - Via Magsaysay Road- Mabini St.
Calamba Nuvali Republic Wakepark SLEX - Canlubang Exit via National Road Newest and Most Innovative Wakepark in the World. Located at Nuvali, Canlubang, Calamba City. Laguna is a major contributor to the development of arts in the Philippines. Paintings and sculptures from Paete, which is the Woodcarving Capital of the Philippines, won national and international awards. Famous artists include Manuel Baldemor, Fred Baldemor, Felix "Kid" Baldemor and Dominic Rubio. HaveYouSeenThisGirl, author of the books Diary ng Panget, Voiceless and She Died who came from San Pablo City, Laguna. 1 2 "Laguna, pangunahing lugar na puntahan, tirahan, at pangalakalan". Philippine Information Agency. 1 2 3 4 5 6 7 "Province Profile". Provincial Government of Laguna. ↑ "28 JULY 1571: The Foundation date of the Province of Laguna". Academia.edu. ↑ "List of Provinces". PSGC Interactive. Makati City, Philippines: National Statistical Coordination Board. Retrieved 18 November 2013. 1 2 3 4 5 6 Census of Population (2015): Highlights of the Philippine Population 2015 Census of Population (Report). PSA. Retrieved 20 June 2016. 1 2 3 "History of Laguna". Calirayalake.com. Retrieved 23 June 2016. 1 2 3 "Province: Laguna (province)". PSGC Interactive. Quezon City, Philippines: Philippine Statistics Authority. Retrieved 8 January 2016. ↑ Congress of the Philippines (March 27, 2015). "Republic Act No. 10658". Retrieved June 13, 2016. ↑ COMELEC (August 18, 2015). "Resolution No. 9982 - Annex B" (PDF). Retrieved June 13, 2016. ↑ "Los Baños". Laguna Travel Guide. 2000-09-17. Retrieved 2012-10-29. ↑ dpwh.gov.ph "Private-Public Partnership - Laguna de Bay Flood Control Dike Expressway (C-6 Extension)"
↑ dpwh.gov.ph "Private-Public Partnership - Calamba-Los Baños Expressway"